Some (but not all) PIMCO funds are losing investors at a fast clip, while Vanguard shines. Morningstar says active funds remain out of favor with investors, who withdrew nearly $35 billion from such mutual funds and ETFs in November. For the past 12 months, investors have pulled more than $175 billion out of the active category. Meanwhile, passive funds attracted close to $31 billion in November and have drawn close to $435 billion in positive flows since November 2014. “Despite the encouraging outlook, investors withdrew $19.7 billion from active U.S. equity funds in November,” said Alina Lamy, a senior analyst with the research group in last week’s report on fund flows. In the week ending Dec. 16, net redepemptions all funds were $28.6 billion, according to the Investment Company Institute, the biggest weekly outflow since June 2013. Some of the outflows likely reflect year-end tax-loss selling, ICI says, noting that about investors withdrew some $11 billion from stock funds and $12 billion from bond funds. Which active fund families are suffering as a result of recent investor behavior? PIMCO’s. The bond shop’s outflows were roughly $4.5 billion in November and stand at $105.4 billion for the 12 months ended Nov. 30, Morningstar reports. Franklin Templeton had active-fund outflows of $3.7 billion in November, and the fund group has seen 12-month outflows of $27.2 billion. Meanwhile, Fidelity Investments had outflows of $2.5 billion last month and $8.4 billion for the year ending Nov. 30. The news is not all bad for PIMCO, according to Morningstar. “PIMCO Income (PIMIX) is becoming a real contender in the fixed-income arena these days, beating out Metropolitan West Total Return Bond (MWTIX) in November with a $1.2 billion inflow,” Lamy said. On the passive side, Vanguard and BlackRock/iShares top the chart with inflows of $14.2 billion and $13.0 billion, respectively, in November. For the past 12 months, Vanguard’s drawn close to $229 billion, and BlackRock’s seen inflows of $94.5 billion. It’s important to keep in mind that most flows into the Vanguard Total International Stock Index Fund, for instance, come from other Vanguard funds, Lamy explains, mainly its target-date open-end funds, along with target-risk and target-date offerings in 529 plans. “These funds tend to enjoy regular flows in the form of monthly investor contributions as opposed to lump sums,” she stated. 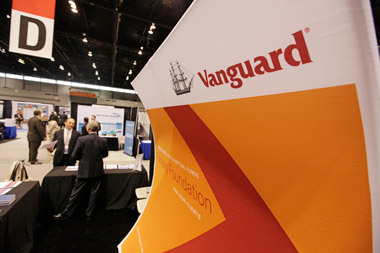 (Vanguard’s inflows total $1 trillion since December 2007. The firm has experienced only two months of outflows over that period, in October 2010 and June 2013). As to where investors are heading, look for more flows into international stocks and passive positions in U.S. equity and taxable-bond funds, Lamy adds.